In keeping with some recent coverage of GTAEF activities outside of the Golden Triangle where Thailand, Laos and Myanmar come together, we will now describe a very interesting program GTAEF supports in former war-torn Cambodia. 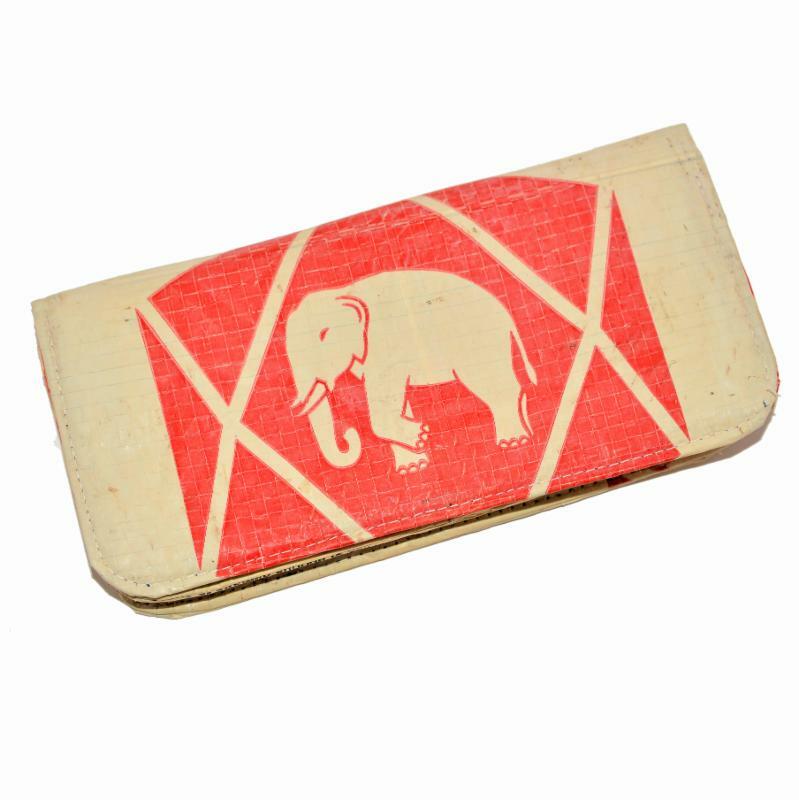 For many years, the world turned a blind eye to the human atrocities of the Khmer Rouge as they destroyed their fellow Cambodians as well as their environment. Accordingly, it is time to look at the humane side of the survivors as they focus on saving their remaining forests and wildlife. 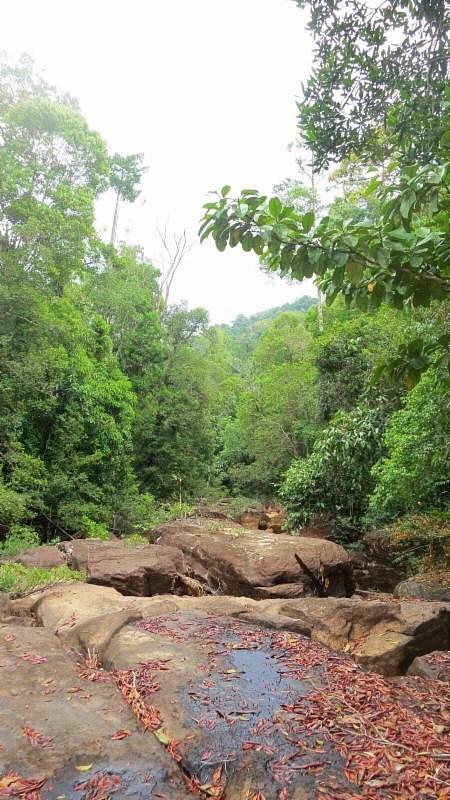 For over three years, the GTAEF has assisted the Ministry of Environment of Cambodia and the Wildlife Alliance in the Cardamom Mountains (Kravanh Mountains in Khmern language) in Koh Kong Province of southwest Cambodia. Although the author has never been there, twenty-five years ago some rather dodgy Thai military officers tried desperately to set up a meeting with the Khmer Rouge on an island immediately offshore of the area. The Cardamoms were the last refuge of the Khmer Rouge and source of illegally cut teak timber sold to the rest of the world through the Thai military. However, not many gringos ever met the Khmer Rouge and came out alive, so prudence prevailed. In fact, the only survivor the author personally knows is Nate Thayer. He is a journalist formerly with Far Eastern Economic Review who interviewed Pol Pot in 2011 regarding his rule of terror and massacre from 1975-1978. 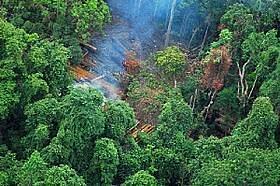 Below is an aerial view of an illegal teak logging operation in the Cardamoms during the referenced period. In a blog entitled Guns & Guards published by John Roberts, our elephant spiritual leader and Director of the GTAEF, referenced a wise Chinese botanist who told him "Without elephants a Southeast Asian forest does not make sense." Elephants carry seeds in their stomachs for up to 36 hours moving them away from the parent tree and depositing them in their own ball of fertilizer and the sunlight of a newly created mini-clearing. However, it takes all of the natural ecosystem participants to maintain a natural environment. Some years back, upon first evaluation of the environmental situation in the Cardamoms, it was evident that there were hunters, snares, fishing nets, and illegal gathering of forest products in the intended sanctuary. Accordingly, the Minor Group, parent of the GTAEF, joined with the Ministry of Environment and Wildlife Alliance to form two ranger stations for wildlife protection. 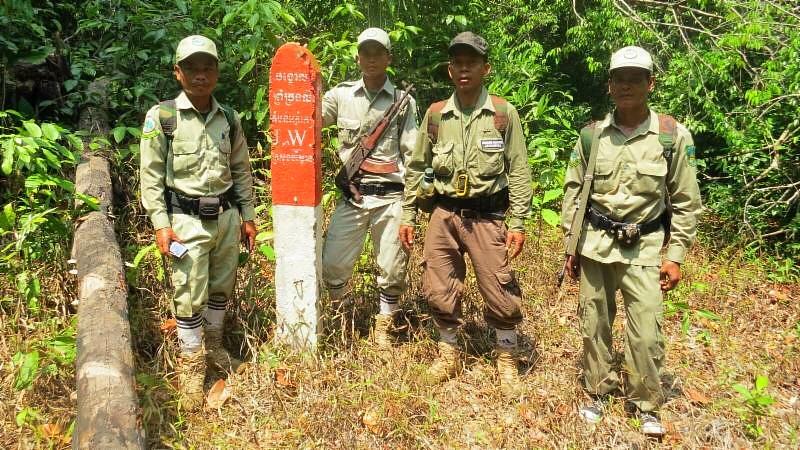 The first rangers recruited were local villagers whose source of income changed from denuding the forest to one of protecting it. The initial work established a perimeter in the park lifting the snares, disabling the traps and warning the people that the forest had become a protected area. A group of rangers is shown below before embarking on a patrol. 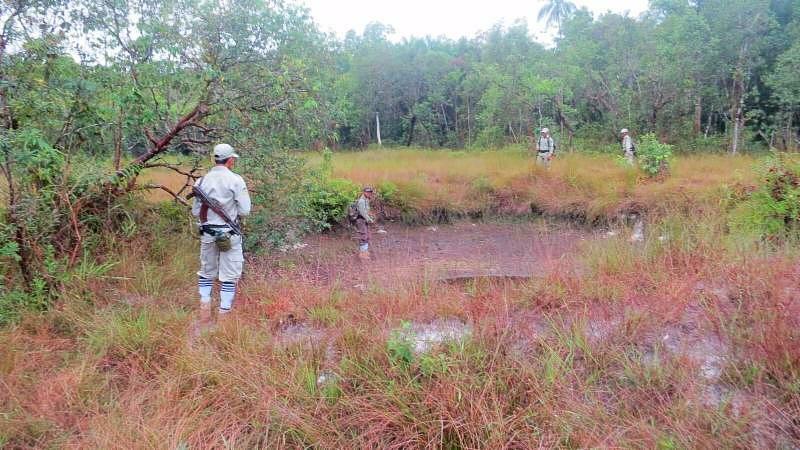 An interesting relic of the Vietnam war era is a B-52 bomb crater that is now a wildlife hotspot as it holds water even in the dry season. Most everything can have unintended consequences but seldom are they good. The next phase of the Cardamoms project is to transition from Guns & Guards to winning the "hearts and minds of the residents." That objective never worked during the Vietnam war but in this case it has great promise. Moreover, during the repressive and deadly period of Khmer Rouge rule, they did establish a clear system of discipline and authority. Accordingly, memories of that morbid and deadly era makes the gentle "hearts and minds concept" even more persuasive. The Elephant Story has secured the actual jackets worn by the rangers in the park and they are being offered for sale. Each purchase will, in turn, provide a complete uniform for the rangers. 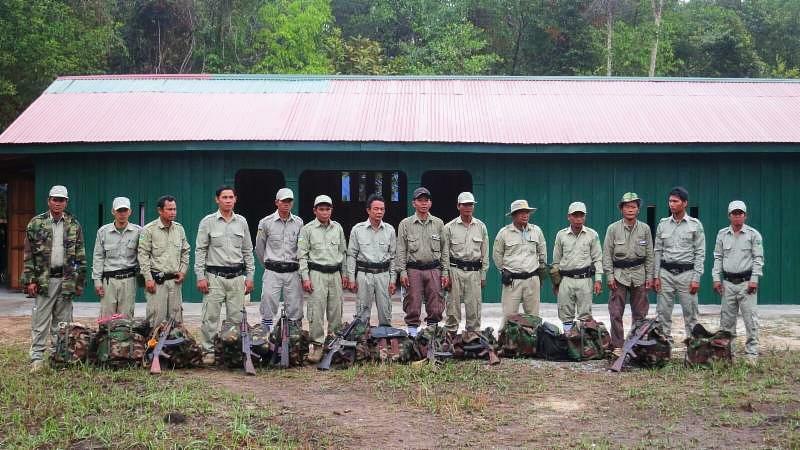 At this writing, 25 pairs of ranger pants and hats have been donated to the rangers. 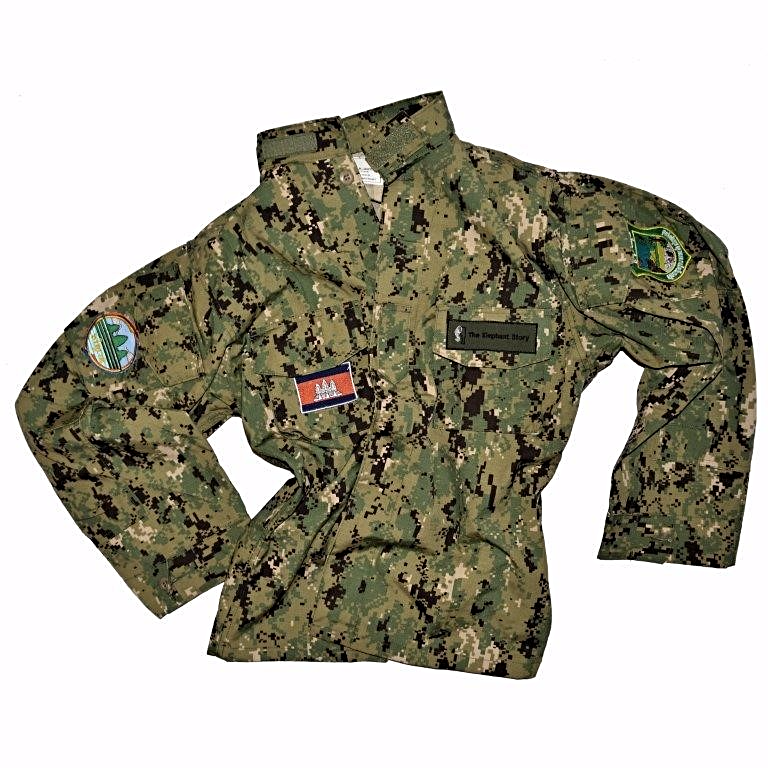 An image of the jacket is shown below. The jackets retail for $125 and can be purchased at The Elephant Story. This past Saturday, April 22nd, was Earth Day! 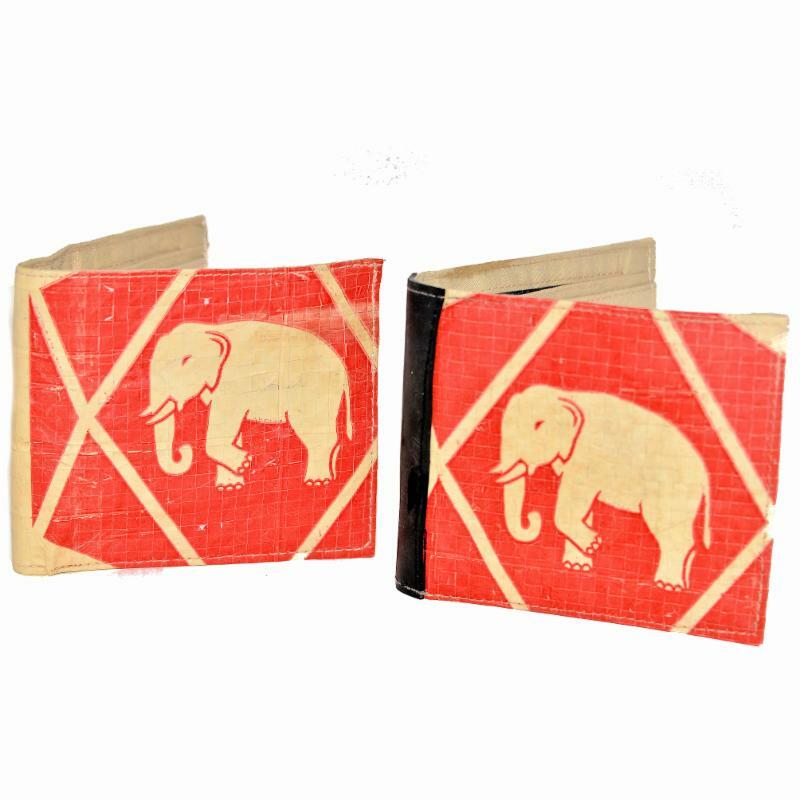 Help celebrate the day by purchasing recycled products such as our Siam Cement Company wallets. 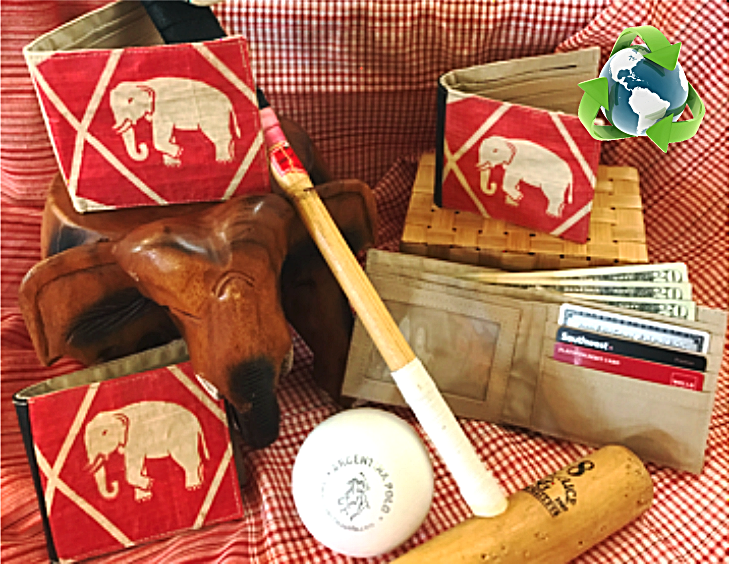 Instead of sending used cement bags to landfills in Cambodia, small fair-trade organizations collect these sturdy bags and make wallets, purses, shopping bags and more to be resold in Thailand.